Coastal Source fixtures are now within the Landscape Lighting Software Program. "Landscape Lighting Software" and "Landscape Lighting Effects" allows you to demonstrate the dramatic effects of night lighting. Coastal Source Fixtures placed on an image where they would be installed. MOORESTOWN, N.J. - March 3, 2015 - PRLog -- Landscape Lighting Contractors who install Coastal Source Landscape Lighting Fixtures or Architectural Fixtures now can use Landscape Lighting Software to design night lighting. Landscaping Lighting Software allows you to create a lighting design without leaving your chair, much less picking up a lighting fixture and running electrical lines. Start with a photo of the yard you are adding landscape lighting to. Now drag or drop and size the landscape lighting fixtures in the location you would like to install them. Add the lighting effects, with in minutes you can show your client what they had a hard time visualizing. Coastal Source has a bonus library of architectural fixtures too. We even included their newest addition the rock speakers, bullet speakers and the turtle audio system. 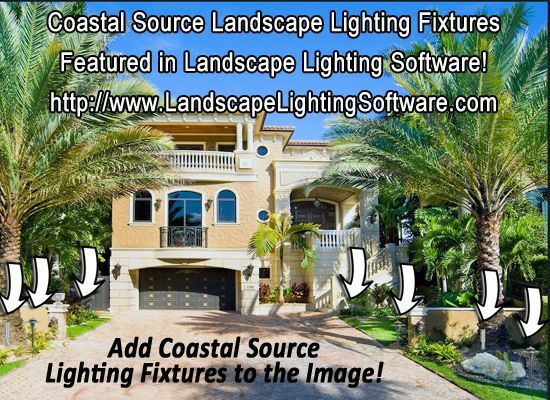 Coastal Source Fixtures are now included when you install Landscape Lighting Software and Lighting Effects Programs. We also have the Coastal Source Library for our GreenScapes program which allows you to design landscape, paving-stone, hardscapes, outdoor furniture, bbq's, fire pits and landscape lighting. It includes a download center where the Coastal Source fixtures can be found.